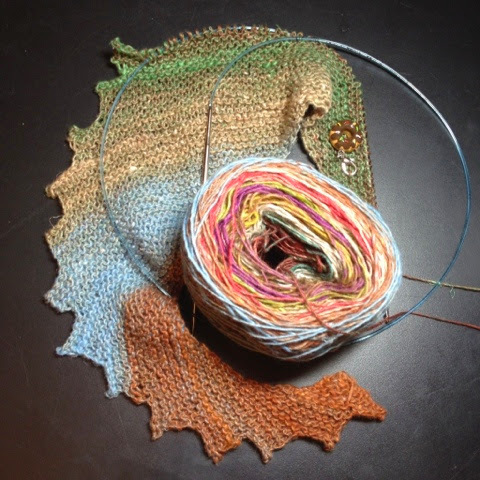 · Last year, when I started knitting socks, I was buying all the yarn that I loved. I bought this Noro Taiyo sock yarn, planning to make socks out of it. After reading about the yarn I found that the high cotton content does not lend itself well to socks that wear well. 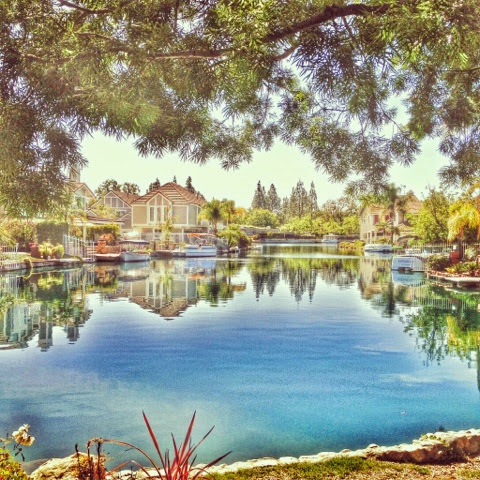 · Meanwhile, with swim season approaching, I have started walking to try to get back in shape. Multiple injuries and aches and pains always make it too easy to be a slug. I like to say I exercise seasonally, and my winter "exercise" is sewing. I might get a lot of projects completed but my waistline and arse do not benefit from all this productivity. I really have no excuse not to walk. We live in a lovely community and the views can be pretty refreshing. Our man-made lake is one of them. The heat has arrived this week, so after the near hurricane force winds die down, I should be jumping in the pool, soon. 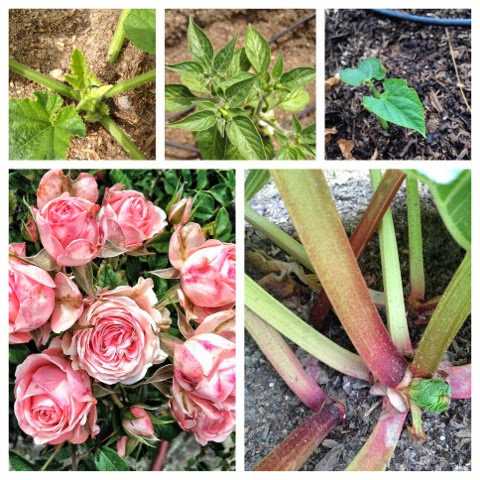 · The garden is sprouting and I have even spotted a few "babies" on the squash and tomato plants. The roses and rhubarb are competing for the "Pretty in Pink" award. · Another exciting thing that happened over the weekend was the canonization of Popes John XXIII and John Paul II. 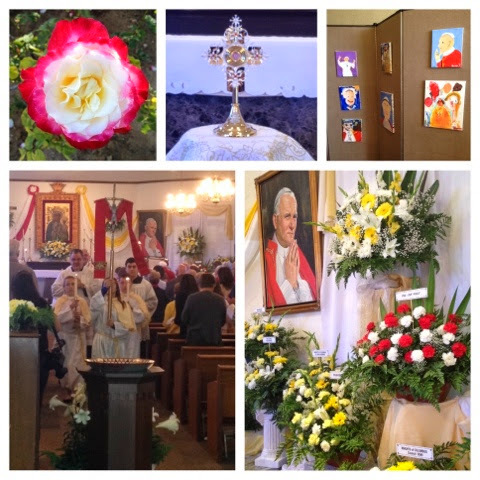 Not to slight John the XXIII, but our church is named after the Polish pope and has a huge Polish community, so we celebrated in grand style. 24 hours of non-stop celebrating. There were masses, parties, meals and live streaming of the canonization mass. I am always proud to be Polish, but this was a special weekend for sure. 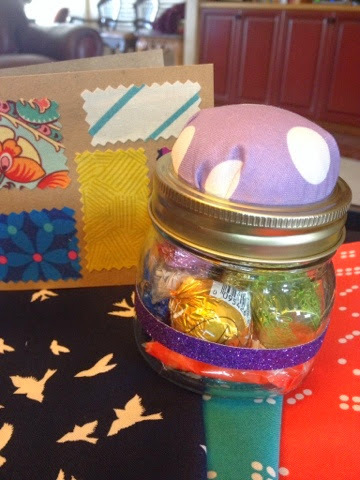 · In the happy mail category, the every lovely Trina sent me a sweet treat, "just because". You should pop over to her blog to see the great quilt she made for her uncle out of upcycled men's shirts. · The weekend ended with a trip to our friend's house in Redondo Beach. 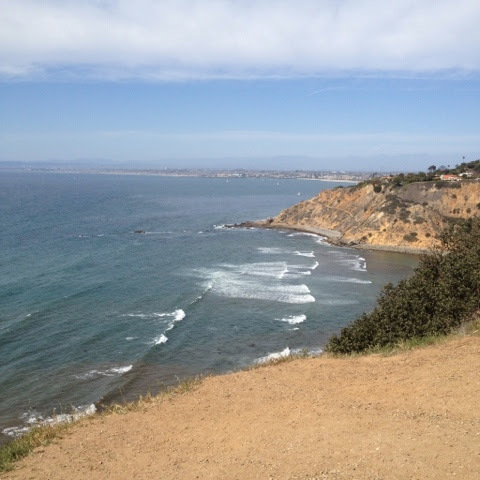 We took a drive to Palos Verdes to go whale watching and enjoyed a great afternoon and dinner with friends, dining al fresco. 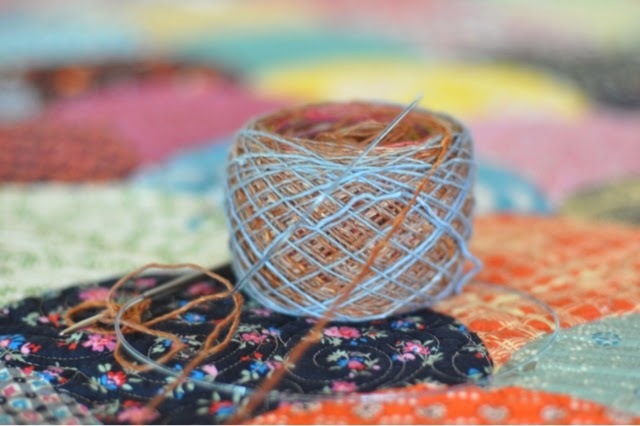 · Remember that yarn? I'm making a Hitchhiker scarf and the yarn is perfect for this project. This is a super easy project and another great one for working on at baseball games and watching TV. Gorgeous photos Di! And who would have thought a nice lady like you would use the a word!! Mind you, I have the exact same problem!! Everyone says how productive I am, so you can imagine the effect that has had on my behind!!! I exercise the ways do housework. In other words, I think about it a lot but seldom get around to doing it. Busy lady, as ever :o) Enjoy the swim time coming up! What a lovely time you are having! I love the look of the new scarf! Is it really as easy as you say? Maybe just for an experienced sock knitter! Sounds like a great week! Love the roses!!! It is looking great around your house, enjoy your walks and the knitting.